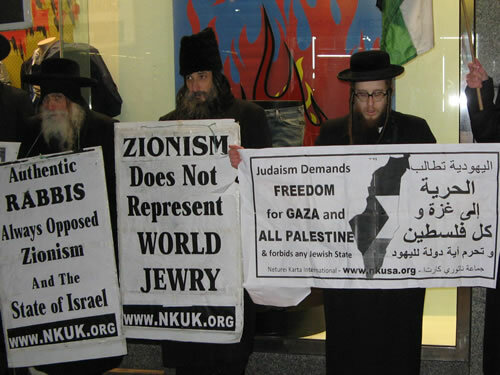 Demonstration for freedom in Gaza and all of Palestine held in London was joined by anti-Zionist Religious Orthodox Jews. A rally also occurred in New York City and in Montreal. On this first anniversary of the Zionist attack on Gaza, we have assembled together to condemn the terrible acts committed by the Zionists at that time. We were grief- stricken when we heard the news then, and we are deeply pained now that the tragedy has not yet ended. This was not the first Zionist attack on Gaza. Furthermore, the tragedy is not only in Gaza; all of Palestine is under this same unjust and illegitimate occupation. A half a year ago, in July, a delegation went to Gaza representing Orthodox Jewish congregations of the United States, Canada, England, and Al-Quds - Jerusalem, Palestine. And presently, as we are standing here today, another delegation of Jewish Rabbis is on its way to Gaza to march in solidarity with the people of Gaza. The purpose of our being here today and of our missions to Gaza is threefold: firstly, to break the Zionist siege and bring to the suffering people of Gaza crucially needed medical assistance, secondly, to let the people of Gaza know that we feel their suffering, and thirdly, to let the world know that the acts committed by Zionists is against the Almighty and does not in any way represent the entire Jewish people, and certainly not the Jewish religion and the Torah. 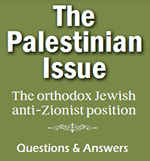 We have to remember the tremendous distinction between Jews and Zionists, and between Judaism and Zionism. Judaism is spirituality, G-dliness, religion and compassion, Zionism is the transformation of Judaism into base materialism, selfish nationalism and the exclusion of the Almighty. In addition, how ironic it is that according to the Torah, Jews are not allowed to have their own sovereign State. Ever since the Temple was destroyed 2000 years ago, Jews have been in exile by Divine decree. We are strictly forbidden by G-d to establish our own state. This would be true even if that state were to be established in an empty, uninhabited land. Now that the Zionists have established their state in a populated land, at the expense of an entire people - the Palestinian people - the crime is much worse. We condemn in the strongest terms the recent attack on Gaza, as well as the decades of occupation of Palestine. We hope for the ultimate redemption, when G-d will bring a spiritual change to the whole world and all mankind will come together to do His will wholeheartedly. We pray for the freedom of Gaza and the freedom of all of Palestine. We pray for the peaceful and speedy dismantlement of the entire State of Israel. We pray for a time when justice will be reinstated and the evil heresy of Zionism will end. Then we will once again be able to enjoy that peaceful coexistence between Jews and Arabs that historically always existed throughout the Muslim world. Free, free Gaza! Free, free Palestine!